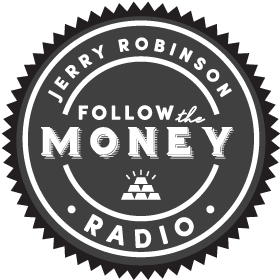 To submit your question for Jerry to answer on the podcast, simply email the question to info@ftmdaily.com; include your name and where you are from, and please keep the questions as brief as possible. 1. (Anonymous listener and FTM Insider) Hello Jerry. Maybe you can clear something up for me. The dollar is being debased and may die in the foreseeable future. If cash will be king at the crash and the dollar is being debased I don’t see the logic in holding a lot of cash just to have it wiped out by a collapse. Also, did all stocks loose their value in the great crash of ’08, and did everyone in the market get wiped out or just most of us? Answer: When we say cash is king at the crash, we don’t necessarily mean it has to be physical dollars in your possession. What we mean is liquidity, but where you keep that liquidity is your choice. We talk about our DSL Savings, where we hold our six months of savings in thirds: U.S. dollars, stable foreign currencies, and physical gold and silver. 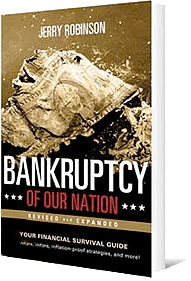 Regarding the market crash of 2008, some people held on and have gained their money back and more (of course, mostly due to the Federal Reserve money-printing policies that have bolstered the stock market), but others sold out at the absolute bottom and are still not in the markets. This is why I like to get out of the markets when the trend starts changing toward to downside, and get back in the markets when the trend starts heading back up. I don’t try to time the bottom or the top, I simply watch the trends and the big institutional investors. This is exactly what I provide for our Market Barometer subscribers. 2. (Samantha in Wisconsin.) I am considering signing up for your Gold member in order to get Jerry’s daily trading ideas. My question is this: what is the best trading platform to go with? Answer: The online broker you choose really depends on your goals and temperament. What do you want out of a broker? If you are new to trading, I would suggest going with one of the more common platforms, like Etrade or Scottrade. These brokers make trading extremely simple, and their trading costs are under $10. The difference between these two brokers lies in the trading tools they provide. I enjoy the real-time charting service offered by Scottrade. I also like Interactive Brokers, and their interactive charts they provide; they offer low-cost trading as well. Another important feature is the mobile applications for on-the-go trading. Interactive Brokers and Trade Monster both offer great mobile services and research tools. I personally use Etrade. 3. (Anonymous listener) I’ve heard that safe deposit boxes can be confiscated in a bank run, and your contents are not very safe there. I own a lot of gold and silver. Is this true about safe deposit boxes, and if so, where should I store my gold and silver? I live in the middle of a big city. Answer: It’s not a good idea to tell others you have a safe deposit box so I’m glad you asked to remain anonymous, because debt collectors and others can request to know the contents if you owe them money. Of course, the government runs the banks, and I would not rule out the idea that they could confiscate whatever they wanted to from the banks (although the chances remain very low at this time). The Justice Department can legally break into your box if they believe you have something in it that threatens national security or that is stolen government property. Some people put cash in their safe deposit boxes thinking it is FDIC insured, but it is not. Also, people put wills in their boxes, but after you pass, it’s often required to get a court order to get into your deposit box, so you definitely want to keep a copy of your will elsewhere so family members do not have to go through that in their time of grieving. Regarding gold and silver in a safe deposit box, personally I don’t do that. I like the idea of keeping it hidden and safe on my own property. Nobody can find it, but I have 24/7 access. There are really only two ways to hold it: keep it yourself or have someone else do it. You could try to find a trusted third party if you don’t feel comfortable holding it yourself. Tom Cloud, our precious metals advisor, has some good recommendations on this. You can reach him at (800) 247-2812. 4. (Steve from Denver, CO) How much money do you think I should keep in physical cash in my possession incase of emergencies or a bank run? Answer: I keep one month of expenses in physical cash in my possession. I keep it hidden at home (not in the dresser drawer, but in an inconspicuous place). If you are worried about a robbery, you might want to have a decoy stash of $100-$200 that robbers can find easily. We also like to keep silver coins in our home and in our Go Bag in the case of a major societal breakdown. 5. (Susan from Lansing, MI) I bought gold when it was in the $1,790’s in 2011. Should I sell it, or do you think it’s going to go back up to those levels and higher? Answer: It’s hard for me to say what you should do without knowing your entire financial situation. But for me (and I bought gold in 2011), I am not selling. I believe we will see another leg up for gold, and based on our Trigger Trade system, we are indeed nearing another long-term buy signal for gold. So, my gut reaction is to say no, unless you desperately need the cash. Even then, I would be looking to sell a different asset, because gold is one of the only forms of insurance you can buy to insulate yourself against the issues coming down the pike in America and the global economy. I don’t believe it is a mistake to have bought gold in 2011. I don’t think anyone will look back in the future and say you were crazy for buying at those levels. I think you will be considered one of the lucky ones who bought low. 6. (Thomas from Dallas, TX) I have a friend who is buying up a ton of the Iraqi and Vietnamese currencies. He told me that he was coming into millions on July 1 after investing several thousand dollars into these currencies. Did my friend make a huge mistake? Is there anything I can do to help him? Answer: Many people got swept into buying the Iraqi dinar several years ago, and this is still a belief held by some “analysts” online. They believe and teach that these currencies are going to revalue and be worth much more than they were at the time of purchase. The Iraqi dinar got very popular after the Gulf War when some of the Middle East currencies did indeed revalue. But so far, this hasn’t happened this time around, and I believe your friend made a mistake for investing thousands of dollars. I bought a few hundred worth of Iraqi dinars as part of my speculative investing, but I would never put more than that on the line. The problem is that so many people don’t have any savings or any solid investments for retirement, so they have to spend their 40’s, 50’s and 60’s trying to hit a financial home run. This is why we recommend having a financial game plan and stop using emotions and hype to make your financial decisions. I offer my personal plan for financial freedom here for free.